Moroz is a Project 12341 small-size missile ship. The ship was laid down on February 17, 1985 at Vladivostok Shipyard; launched on September 23, 1989; commissioned on December 30, 1989; joined Pacific Fleet on February 28, 1990. 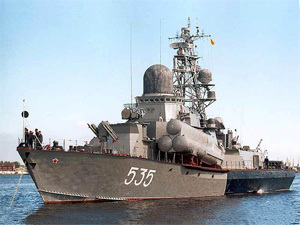 In 1999 the ship won the Navy Commander's Prize for missile firing.